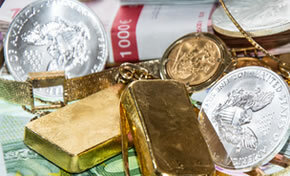 Precious metals declined as a group Tuesday. Losses in gold and silver where their third in a row with both ending at nearly two-week lows. Gold for December delivery fell $9, or 0.7%, to settle at $1,213.40 an ounce on the Comex division of the New York Mercantile Exchange. The finish was the weakest since Nov. 14. "Technically, the gold bears have the overall near-term technical advantage and gained downside momentum today," Jim Wyckoff, a senior analyst at Kitco Metals Inc., said in a report. "Gold bulls’ next upside near-term price breakout objective is to produce a close in February futures above solid technical resistance at the October high of $1,252.00." Gold futures ranged from a low of $1,219.40 to a high of $1,225.20. They dipped less than 0.1% on Monday. Elsewhere, silver for December delivery declined 12.1 cents, or 0.9%, to settle at $14.084 an ounce. The settlement was also the lowest since Nov. 14. Silver futures traded between $14.14 and $14.27. They fell 0.3% on Monday. January platinum lost $12.50, or 1.5%, to $835.30 an ounce, ranging from $832.50 to $848.70. Palladium for March delivery — the new, most active contact — shed $1.80, or 0.2%, to $1,122.10 an ounce. Palladium prices traded between $1,111.10 and $1,129. Gold declined $2.20, or 0.2%, to 1,221.20 an ounce. Silver fell 10.5 cents, or 0.7%, to $14.275 an ounce. The United States Mint has not reported any increases in bullion sales for more than a week. Below is a sales breakdown of U.S. Mint bullion products with columns listing the number of coins sold during varying periods.